Click here to see our blog with stories and photos from the successful field campaign! In mid-December 2018, we set sail onboard the R/V Roger Revelle in the waters east of North Island, New Zealand to carry out a marine EM survey of the Hikurangi subduction zone (HSZ). We collected both passive magnetotelluric (MT) data and controlled-source electromagnetic (CSEM) data using a fleet of 42 ocean-bottom EM receivers and an electric dipole transmitter system. 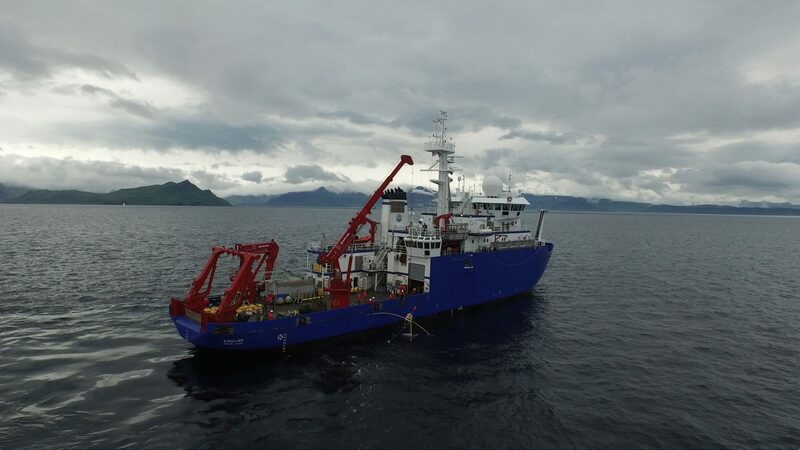 The survey plan involves 168 receiver deployments and recoveries as well as over 400 line-km of transmitter deep-tow operations, making it the largest marine EM experiment at a subduction zone yet. 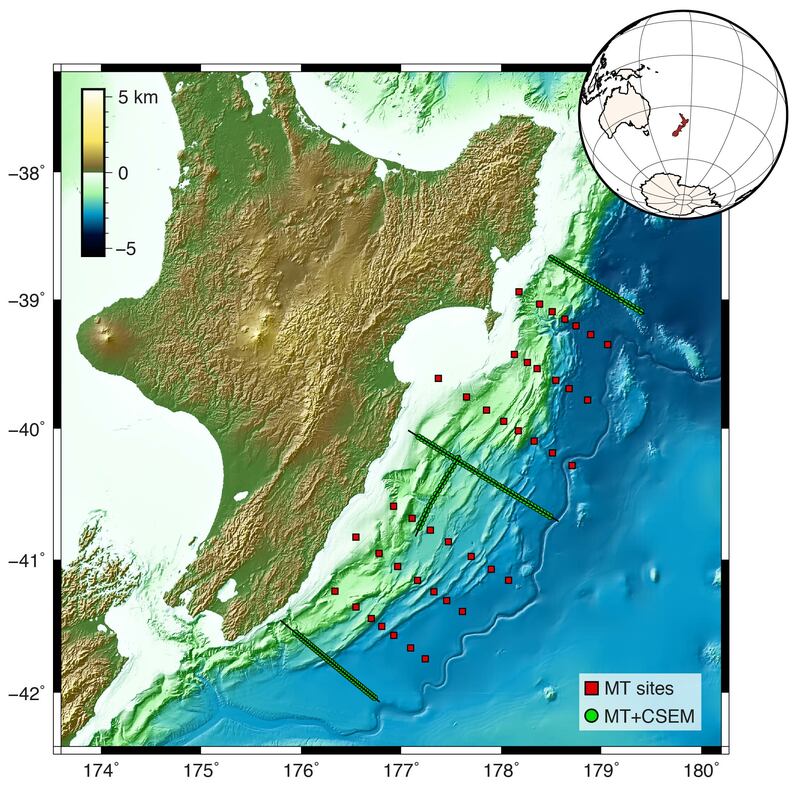 Map of the survey area offshore North Island, New Zealand showing the site locations of ocean-bottom EM receiver deployments at the Hikurangi subduction zone. Green circles mark the sites where MT and CSEM data will be simultaneously recorded. Red squares show MT sites where 40+days worth of data will be collected. The HSZ provides an ideal natural setting to assess the role that fluids play in both generating subduction zone earthquakes, and in controlling the seismic behavior of faults more generally. In the northern half of the margin, geodetic observations have detected shallow, regularly repeating slow-slip events (SSEs). These are a unique class of earthquakes that radiate little to no seismic energy and thus cannot be detected with seismometers, yet they can release energy equivalent to a Mw 6 or larger earthquake over the course of several days to weeks. In the southern half of the margin, there are only deep SSEs observed, suggesting that the shallow fault is fully locked and capable of generating devastating megathrust earthquakes. A leading hypothesis states that the flux of fluid controls the prevalence and style of earthquake slip, since trapped fluids reduce the effective normal stress of faults. This leads to the following prediction for the HSZ: a large volume of fluid is subducting in the north relative to the south. To test this hypothesis, we will use the CSEM and MT data to image the electrical resistivity structure beneath the seafloor and, ultimately, to map the distribution of fluids within and above the megathrust fault. Since seawater is highly conductive and the seafloor is otherwise highly resistive, the bulk resistivity that we image will vary as a function of the total fluid content in the subsurface.